Break the ceiling touch the sky – the success and leadership summit for women ® , from House of Rose Professional (HORP) is the worlds fastest growing forum for women in leadership and male champions for diversity enabling leaders from around the world to learn, network and achieve via editions in the USA, India, Middle East, ANZ, Singapore. 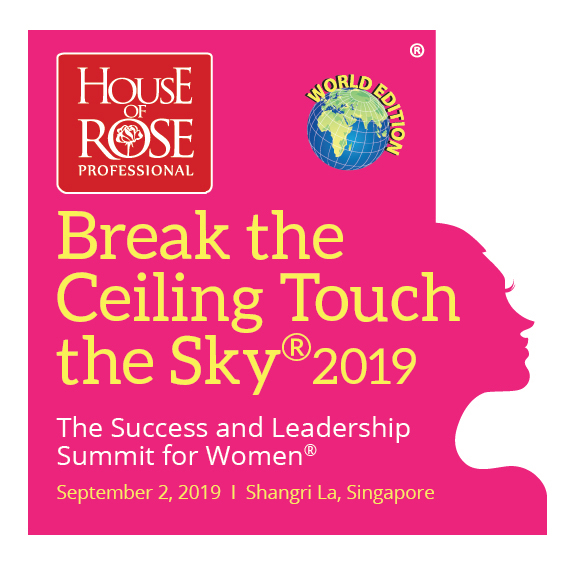 The 2019 WORLD EDITION of the summit, to be held in Singapore on Sept 2, 2019 features over 30 inspirational leaders from the worlds best organizations to share with delegates their best practices for success and leadership and an additional 25 international leadership coaches and business leaders supporting HORP’s customised mentoring module. Over 550 senior leaders are likely to attend. SCWO is one of a few prestigious INDUSTRY PARTNERS to the summit and members are eligible for the INDUSTRY/NETWORK PARTNER preferential rates for the summit. Sign up for the summit enables free entry to the evening cocktails and Leonie awards. The theme for this years forum is the FUTURE. Top international trends (AI, Collaboration between corporate and entrepreneur, geopolitics, multiple career paths and succeeding in Singapore and across the world), work-life integration, best case studies of gender diversity and its impact on business, networking to build powerful networks, wellness for high performance are some of the topics the experts will share their best techniques on. This year optional workshops will be a key part of the summit.